The Google Nexus Player is a set-top box with numerous focal points, not least of which is gaming. For that it needs a controller, and lo and behold, the Gamepad for Nexus Player has appeared on its own page in the Google Play store. We've seen the Asus-made controller previously, but as of now it's available for pre-order. 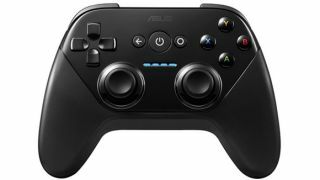 The listing reveals that the Gamepad for Nexus costs $40 (about £25, AU$45) and ships in three to four weeks, the same time frame as the Nexus Player itself. Like other modern game controllers, the Gamepad for Nexus features two analog sticks, a directional pad featuring four separate buttons, two analog triggers, four face buttons, and two shoulder buttons, in addition to Android navigation buttons. With the controller being sold separately it's clear that the Nexus Player is a set-top box first and foremost, but it does support up to four controllers at once for multiplayer gaming. Its Bluetooth connection also enables a range of up to 30 feet, and it's powered by two double-A batteries. The controller and Nexus Player combined might make for a decent Android gaming device, but the gaming ecosystem still has a long way to go to catch up with this hardware.